The Australian Clownfish (scientific name: Amphiprion rubrocinctus), also known as the Red Anemonefish, is a brightly colored variety of the Tomato Clownfish found in the class Actinopterygii and is a member of the family of Pomacentridae. 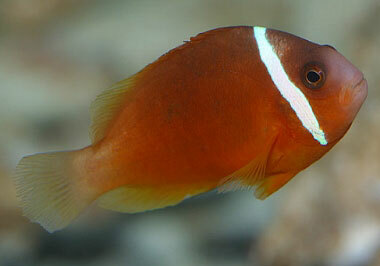 They exhibit the same shape, size, behavior and even temperament as the Tomato and the Cinnamon Clownfish. The whole body of the Australian Clownfish fish is excitingly tangerine bright orange in color with a large white bar on its head. But unlike other Tomato and Cinnamon species, the Australian Clownfish lacks the black outline around the ridge of the head bars. This beautiful fish is often fairly active. When inside the aquarium, the fish creates an eye-catching, gorgeous focal point. They were the first known saltwater fish species to be aqua-cultured, and have been bred for over 50 years. They symbolically associate with other species including the anemones such as corallimorpharians and large-polyp stony corals. However, by nature the Australian Clownfish is generally territorial especially when defending their niche. It can aggressively attack and chase away other tankmates, including members of its own species. But, in contrast, a small number of species such as the False Percula are known to be very tolerant and peaceful. The fish feed on common aquarium foods and are well-adapted to almost all the aquarium diets. They love to eat frozen mysid shrimp, brine shrimp among other commonly available commercially frozen fish foods. The Australian Clownfish also readily accepts dry foods such as flakes, pellets, granulated or freeze-dried foods. A large number of them have also been observed to eat algae products like spirulina. The Australian Clownfish mate for life and a single nest of their eggs may only have a few survivors making it into adulthood. But, when farm-raised, a larger number do survive into adulthood. It is worth noting that wild-caught clownfish have very high mortality rate after their transport. This has been attributed to a number of factors including bacterial infection, the Cyanide drugs used to capture them and single-cell parasite infestation. So it is recommended that if you need to purchase one, then go for a captive-bred type.